Why did we act so surprised? I was three days late, swelling out of my own skin, and she was about to go on vacation. But the whole “scheduling” of our first child’s birth seemed too unorganic for me. And I’m not even a hippie. I don’t even shop at Whole Foods (regularly). (It’s really just too expensive, ya know?). Setting an alarm to wake up and go have a baby felt very anticlimactic, especially since every tick-tock I heard throughout the final week of my pregnancy left me in “IS THIS IT? !” “IS IT HAPPENING? !” “COULD IT BE NOW? !” “NOW? !” “NOW NOW NOW?? ?” I was on edge and totally expected that with every step I took, the very next one would be in a pool of my own water. So when Dr. Fiiiine suggested we induce the next day, that left Bryan and me a handful of hours to live it up as a married couple with no responsibilities. We tidied up the house, packed the last minute toiletries, set up Princeton’s overnight bag (yes, he had a bag! 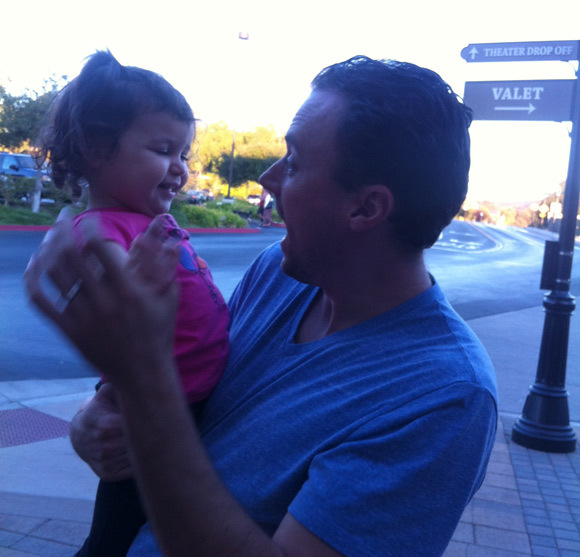 ), and had our last dinner out at our first born’s favorite restaurant: Lazy Dog Cafe. We’d sat out on the patio with Princeton dozens of times. People would always crouch down and gush over him and he loved the attention, wagging his tail in delight and with pride. I loved seeing other dogs there and talking with all the fellow dog lovers at the dog-themed restaurant. It’s a special place for that alone. And we felt we owed it to Princeton, to give him a night out at his favorite restaurant on his final evening as our only child. 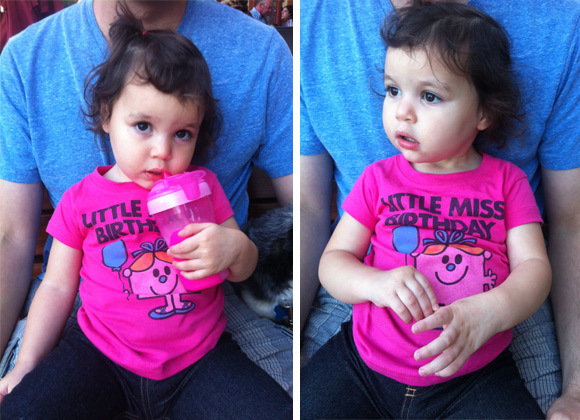 So last year, we brought Madelyn the night before her first birthday. The hostess who’d seated us the year before when I was a night’s sleep away from being admitted to the hospital remembered us on Madelyn’s birthday eve. “You’re the couple who came in the night before you were having a baby, right?” Yes. “And this is her! Wow. That’s amazing.” We got free dessert last year. And just like Tevye, we believe in tradition. So tonight, we went back to Lazy Dog for a 3rd Eighth of August dinner. Princeton got attention and Madelyn did, too. She performed for all the tables around us. Last year, she couldn’t speak any words and had no interest in crayons. 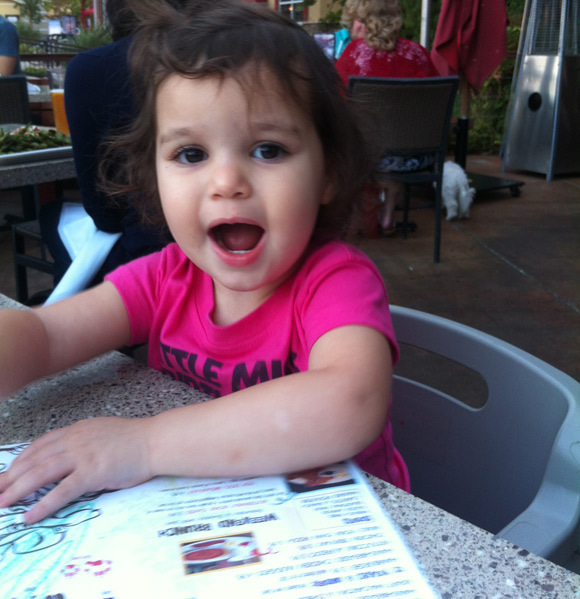 This year, she did a one-toddler show for the other diners on the patio and also passed time drawing pictures and naming the crayons’ colors. Birthday Eve has changed again. Madelyn was in a great mood tonight. It’s like she understood that tonight and tomorrow and the whole weekend ahead are all about her. 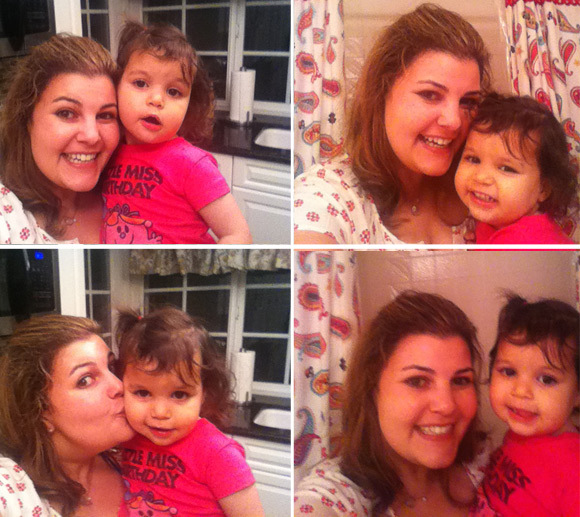 She confidently announced that she’s TWO and couldn’t stop asking for tickles and kisses at bedtime. We had a mini photo shoot and made silly faces at each other and then ruined our staring contests with uncontrollable shrieks of laughter. 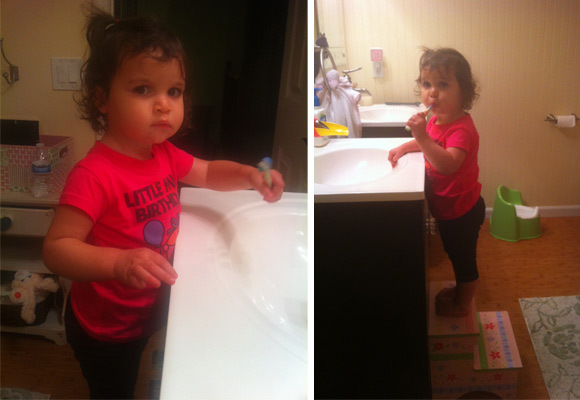 She brushed her teeth like a big girl and I stared in awe as she went through the motions of her routine. Last year, she couldn’t even walk to her sink. The year before that, I could barely walk at all. Maybe I’m overly nostalgic and sentimental, but I can’t help but mark time with events like Birthday Eve at Lazy Dog dinners or reflecting on the changes over the course of a year. I suppose time is the one thing we truly have no control over. That, and the fact that Madelyn will always be my baby, no matter how many birthdays we celebrate together. Happy 2nd birthday tomorrow, Madelyn. You have made me happy, smile & laugh everyday for the last 2 years! 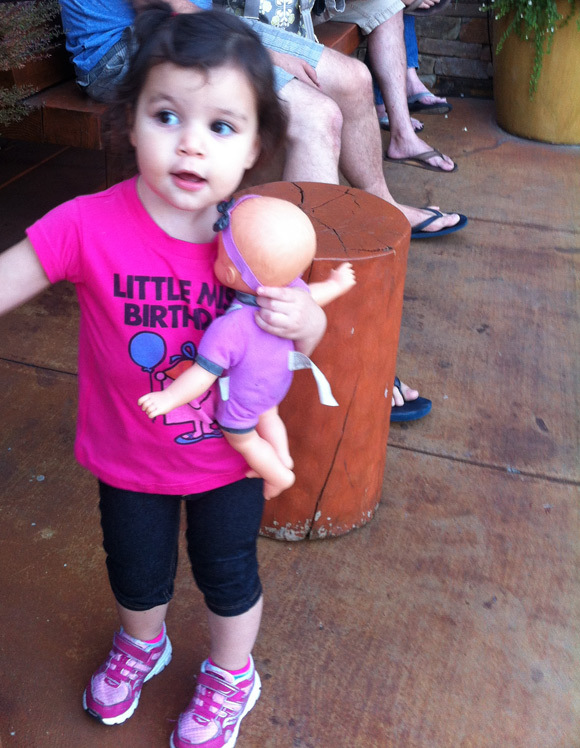 You are the BEST MOST ADORABLE granddaughter in the world.